I served as an advisor (and even got to teach one class) for a project by George Mason University graduate students this spring semester. With deliveries expected to increase by nearly 30 percent in the next decade, it is an area that needs more consideration, said Paul Mackie, communications director for Mobility Lab. 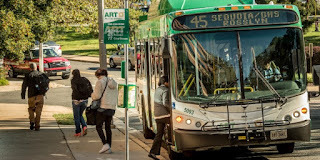 “The Mason recommendations are very practical and should be useful to Arlington, which is already pretty well-connected because of its many transportation options,” Mackie said.